Thank you for your support during this difficult time. Please enhance this tribute to Pansy by adding your memories and photos. 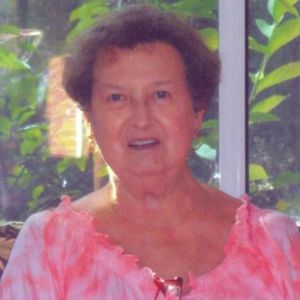 Pansy Lorine Charpia Leppert, 76, of Charleston, South Carolina, widow of Roan Joseph Leppert entered into eternal rest Wednesday, March 13, 2019. Her Funeral Service will be held Sunday, March 17, 2019 in St. Andrew's Parish United Methodist Church, 3225 Ashley River Road at 3:00 p.m. The family will receive friends in the church from 2:00 p.m. until the time of the service. Interment will follow in Live Oak Memorial Gardens. Arrangements by J. HENRY STUHR INC., WEST ASHLEY CHAPEL. Pansy was born September 25, 1942 in Charleston, South Carolina, daughter of the late Grady Hamilton Charpia and Alice Knight Charpia. She was a retired insurance claims adjuster with The General Agency. Pansy loved her family, quilting, going to the beach and was always giving to others. She was a member of St. Andrew's Parish United Methodist Church. She is survived by her son, Timothy J. Leppert (Betty) of Charleston, SC; granddaughter, Jamie Leppert Brown (Scott) of Moncks Corner, SCbrothers and sisters, Joyce Duncan, Diane Miller, Linda Reeves, Betty Charpia, Carl Charpia, Marsha Charpia and Ken Charpia. In addition to her parents and husband, she is preceded in death by her daughter Sue Ella Leppert and brothers, Wayne and Zernie Charpia. Memorials may be made to St. Andrew's Parish United Methodist Church, 3225 Ashley River Road, Charleston, SC 29414. Please accept our heartfelt sympathy in the passing of Pansy. She was a beautiful woman, inside & out. You're ALL in our thoughts, our prayers, & our hearts! May the many wonderful memories you share, help to sustain you during this difficult time. My husband has bronchitis & I'm recovering from surgery, so we can't attend the service tomorrow. However, we will be there with you IN SPIRIT. Pansey,I will surely miss you but I know that you were needed elsewhere. Resting in Gods arms. May God comfort the family and friends during this time and always. My deepest condolences to you Tim. So very sorry for your loss. Life Stories provides friends and families a forum to post their favorite stories and memories of Pansy Lorine Leppert ensuring the precious experiences are never forgotten. Share joyful times, post a photo that captures the moments you cherish, and allow others to reply, relive and remember.